I seem to have got in to a pattern of getting out on my bike on alternate weekends. Today's ride had the same cafe stop as the last one: Bell Mills Garden Centre near Driffield. 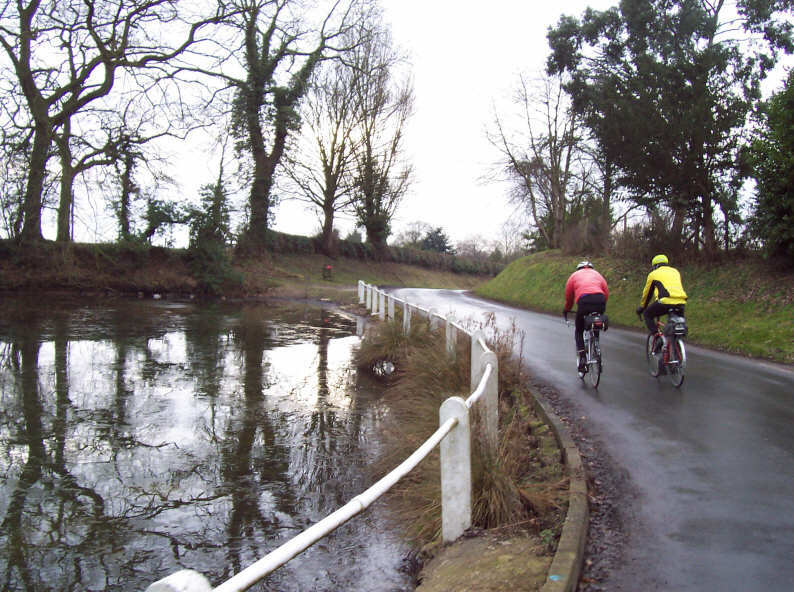 I didn't mind – despite the grim weather I enjoyed it – and the variations to the route helped me to orientate myself as part of my ongoing education: the towns and villages of the Yorkshire Wolds and Holderness Plain. Today it was Wawne, Brandesburton, North Frodingham, Skerne, Driffield, Watton, Kilnwick, Lockington, South Dalton, Etton, Walkington and Skidby amongst others. 62 miles. I still can't help scrunching my face when I try to think of where all the places are in relation to each other. (Following the routes of the Big Skies Bike Rides – mostly on my own – has helped, but it's taking a while.) Perhaps I should be grateful that there are so many. At least I'll never get bored. The pond at South Dalton (edit: The Mere). On a wet but rewarding day out. Posted by Chris on January 30th, 2011. The pond would have been frozen over on this side of the Pennines but it's been dry and sunny. 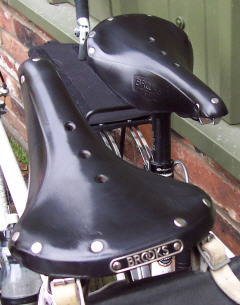 The Brooks saddles are lovely. Black is the best colour I think. It takes fortitude to set out in that type of weather for a ride of 100 kms – good work. Over here the ice on the pond would be at least a foot thick. We passed through Lockington and there were still chunks of ice at the edges of the ford I stopped at four weeks ago. On Saturday morning and this morning I woke up to quite a frost. Morning ice... = no cycling until it thaws, which means getting collared for housework or such like, I prefer to get out there early in the day.